Black G shape Radio Earpiece & Mic. G shape soft rubber ear hanger earphone earbud with ergonomic designed PTT & Microphone. Excellent audio quality, Kevlar reinforced wire. Suitable for use with Motorola Kenwood Icom Vertex Maxon HYT and more. MOTOROLA - GP300 CP040 XTN446 XTNI446 XTNID446 GP340(with adaptor). Clear G Shape Radio Earpiece & Mic. 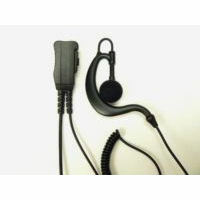 Mid - Range 2 Wire Clear Soft Rubber Adjustable G-Shape Radio Earpiece & Mic. Features a soft rubber adjustable G-Shape earphone. Further to the successful launch of the digital DP4000 Ex Series ATEX radios, Motorola has issued an Intent to Cancel Notification for the ATEX radio predecessors; the analogue GP Ex Series. Motorola have introduced a battery which will work with both the Blue and Black version of the Atex portables, the part number is NNTN5510DR, the existing batteries, NNTN5510BR, NNTN5510CR and NNTN7174AR are now discontinued. Kenwood launch TK-3301 the replacement for the successful TK3201.